Os grid reference: NS 8435 7985. About halfway between Bonnybridge and Tamfourhill in the Falkirk region of Stirlingshire, in what “was” the ancient kingdom of Dumnonia, are the very well-defined earthworks of Rough Castle Roman Fort, a 2nd century Roman military site attached to the Antonine Wall (south side), which is ‘said’ to be one of the best preserved forts in Scotland, and certainly one of the most notable in Britain, according to the work ‘Ancient Monuments Scotland’, an HMSO guide. Although it was only a temporary fort it was well endowed with a number of military buildings and, at the east-side a bath-house, the foundations of which were discovered during a number of Archaeological excavations in the early 1900s. The fort was built upon a north-facing and very commanding escarpment, beside a ravine into which the Rowan Burn flows, which no-doubt aided the security of the fort somewhat. The town of Falkirk is 1 mile to the east and Larbert is 2 miles north. 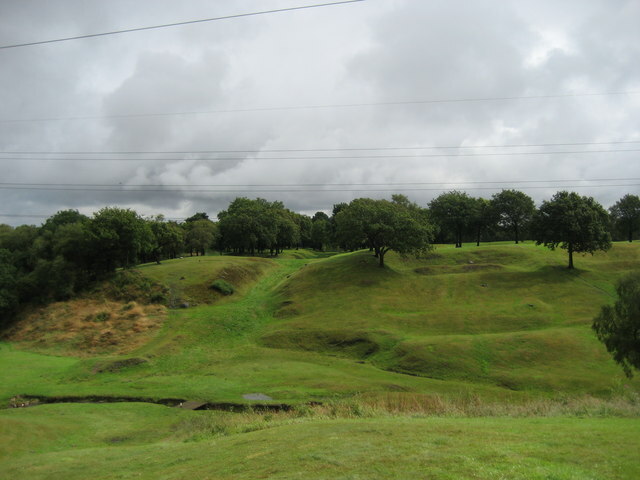 The fort stands at the south-side of the Antonine Wall (part of the north-west frontier) and, in particular, the section behind the fort (north and north-west side) with its deep-ditch and rampart is one of three that are extremely well-preserved, although the actual Roman wall itself, or what constituted as a wall at the time, has mostly disappeared leaving only the earthworks as a reminder. 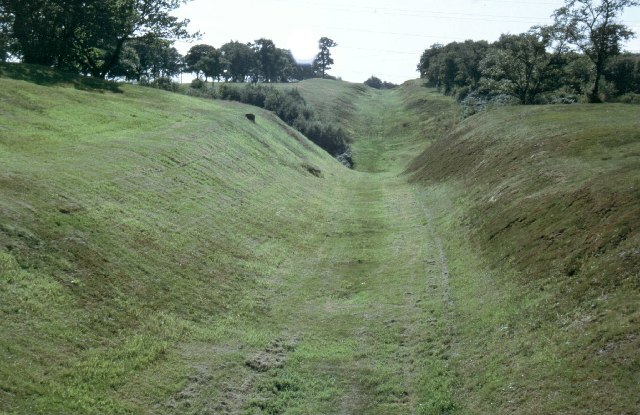 The Antonine Wall, built about AD 143, is actually a V-shaped ditch which was 15 Roman feet wide with a rampart of turf on a stone base, a military way that ran for 36 miles (40 Roman miles), linking the Firth of Clyde at Old Kilpatrick in the far west, to the Firth of Forth at Bo’ness in the east. It was built soon after AD 143 to a planned line, earlier set out by Julius Agricola (c 80 AD), by the legate Lollius Urbicus and named after the emporer at the time, Antoninus Pius; but militarily it was nothing like Hadrian’s Wall, although it was called ‘a permenent frontier’ at the time of building, and that’s what it was to remain – in the landscape at least. The Rough Castle fort covered about 1 acre, so fairly small compared to some of the forts in England and Wales. It was called a ‘wall fort’ because it abutted up against a Roman wall, in this case the Antonine Wall. Typically it was square-shaped with curved corners but with no lookout towers, although there were the usual four side entrances at the N.S.E.W. Built around 142 AD as a temporary fort, spaced at a two mile interval with its near neighbours – Seabeg to the west and Watling Lodge to the east; at Watling Lodge there is another well-preserved section of the Antonine Wall. But Rough Castle only lasted for just over 20 years, and by 163-4 AD the wall and its 19 small forts and 14 temporary forts were abandoned, Hadrian’s Wall further to the south being occupied instead! However, for a short period around 210-11 AD Rough Castle was re-occupied. The double ditches and ramparts of the fort, and its annexe are well-preserved, especially at the east, south, and western sides, that at the north-side being the much deeper defensive ditch and steep rampart of the Roman wall. 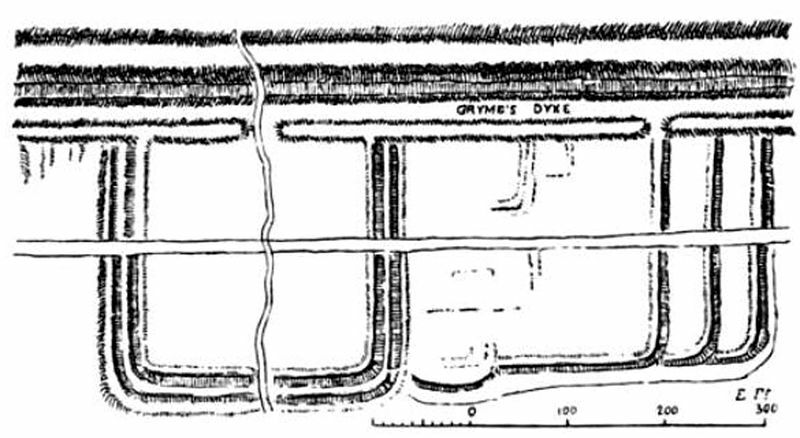 During Archaeological excavations in 1902-3 the foundations of numerous buildings were discovered within the fort and, in the annexe a bath-house, including: an headquarters block, barrack block, commandant’s house and a granary; also a series of defensive pits (lilia) outside the Antonine ditch on the left front of the fort were found, according to the work ‘Ancient Monuments Scotland’, which goes on to say that: “Two inscriptions identify the garrison, the 6th Nervian cohort”, one of six infantry units of up to 500 men from north-eastern Gaul who were honoured with the title ‘Brittanica’, according to the very excellent work of I. A. Richmond ‘Roman Britain’. Further excavations took place at the fort in 1932, 1957 and 1961. Bedoyere, Guy de la., The Finds of Roman Britain, B.T. Batsford Ltd., London, 1989. H. M. Stationery Office, Ancient Monuments Scotland, Illustrated Guide, Volume VI, Edinburgh, 1959. Richmond, I. A., The Pelican History Of England 1 Roman Britain, second edition, Penguin Books, Harmondsworth, Middlesex, 1963. Categories: Misc Subjects, Roman Sites | Tags: Rough Castle Roman Fort and Antonine Wall in Stirlingshire, Rough Castle Roman Fort at Bonnybridge in Scotland | Permalink. Antoninus Pius was Emperor 138-161 AD. He succeeded Hadrian perhaps Rome’s Greatest Emperor and was probably seen as a safe pair of hands whilst Hadrian’s real heirs his nephew Marcus Annius Verus later the Emperor Marcus Aurelius and Lucius Ceionius Commodus the son of a close friend came of age. Antoninius Pius was 51 when adopted by Hadrian. It might not have been expected that he would live to 74. The Senate gave him the title ‘Pius’ which means ‘dutiful or respectful’. Indeed this was how he conducted the affairs of being Emperor. But like all Emperors he needed to do the things Emperors did. Public works were one feature of this with new buildings in Rome and across the Empire but also the odd bit of conquering of new Territory. In Antoninus’ mind the Antonine Wall was probably seen as the right thing to do effectively establishing an area of no mans land controlled by Rome to defend the rest of Britannia. Unfortunately it did not prove effective or economical and 20 years later the troops moved back to the better defended position that was Hadrian’s Wall.